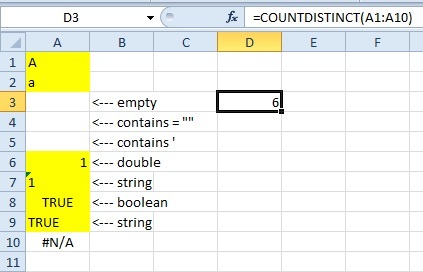 ← VBA: What Type Are Your Constants? A handful of posts ago I looked at some FREQUENCY() formulae which could give a count of distinct or unique values in a given column. 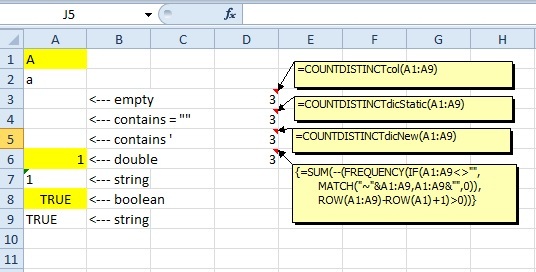 The formulae became quite complicated and slow – particularly when dealing with mixed data types – so, in this post, I’m going to have a go at creating some VBA User Defined Functions to do the same thing. A UDF is simply a custom function (written in any language) which is called from a Range or, in other words, used in a worksheet formula. From this list, I would say there are 6 distinct values: a, b, c, d, e and f. I use the word ‘distinct’ to mean ‘different’ – the same as it is used in the SQL world . 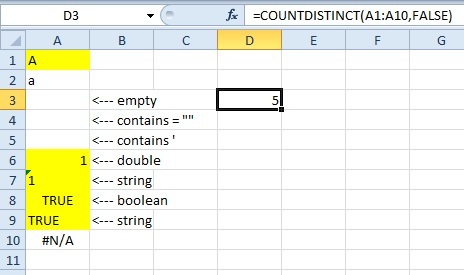 From this list, I would say there are 3 unique values: c, d and f. The unique values are the ones which appear exactly once in the list. This formula was broken down and explained in detail in my other post, so please have a read through that if you’re not sure how it works. I’ll design the basic UDFs in a somewhat contrived fashion so that they give the same results as this formula and then I’ll do some benchmark testing to see which one is faster to calculate. I’ve made a workbook available for download which has all of the below UDFs. In summary, each item in the Collection must have a unique key and that unique key must be a String. If the code tries to create a duplicate key then an error is raised. The error is ignored due to the On Error Resume Next directive. 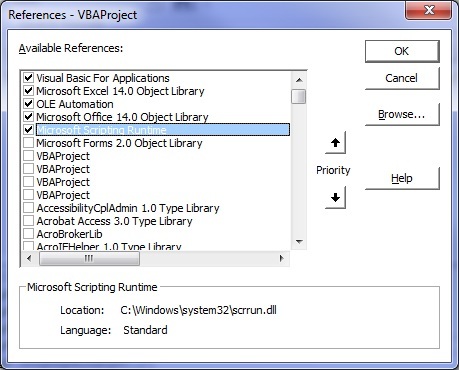 A feature of the VBA Collection object is that the key is case-insensitive. I’ve actually written two Dictionary object UDFs for benchmarking because there are a couple of ways the Dictionary object can be created and maintained. Firstly, a new Dictionary object could be created every time the UDF is called or, secondly, a Dictionary object could be created on the first call and then cleared (but not destroyed) by using the Dictionary.RemoveAll() method on subsequent calls. The Dictionary class is part of the Microsoft Scripting Runtime library (scrrun.dll) and since I’ve used early binding in my code, a reference needs to be added to it in the VBA IDE under Tools > References. First let’s verify that the UDFs all return the same result as the FREQUENCY() formula. As you can see, all four formulae are type-insensitive (they don’t distinguish between text, numbers, logicals etc) and case-insensitive (for example, they don’t distinguish between "A" and "a" ). The FREQUENCY() formula performs the best when all the values are the same but becomes extremely slow when all the values are different; in fact, I gave up timing it beyond 10,000 cells. There’s no material difference between the two Dictionary object UDFs which surprised me. I expected the static one to be faster until the number of items in the Dictionary from the previous call became very large, thus slowing down the RemoveAll() method. All of the formulae are pretty fast when all the values are the same. The Collection object UDF would generally seem to be the best overall choice. Now the Dictionary UDFs are the fastest in both scenarios. Given the performance tests and the features of each UDF, my general choice would be to go with the Dictionary object. If you specifically want a type-insensitive and case-insensitive UDF then go with the Collection object. I’ve enhanced the basic, static Dictionary UDF below to give it a bit more punch. One of the changes I’ve made is to reduce the precedent range if a whole column reference has been passed in. To do that I’ve used the Worksheet.UsedRange property which Charles Williams recently blogged about: it can become extremely slow if there are a lot of cells containing data or formatting on the worksheet (it’s not the size of the used range that matters) because it internally reads from the Cell table. Have a read through his blog post – you might decide that you would prefer to remove it or use an alternative approach. 'including formulae which return ""
It will count number, text and logical data types but it ignores error values such as #N/A and DIV/0!. It ignores empty (and blank) cells. It is case-sensitive by default. It differentiates between data types. For example, these two formulae would be considered to be different: =TRUE() ="True" , as would ="1" and =1. A reference to the Microsoft Scripting Runtime library is required. 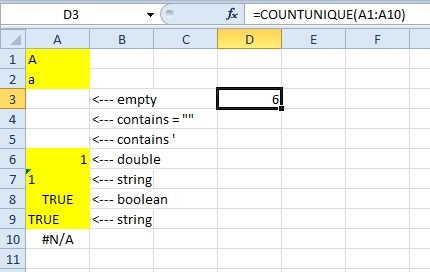 If you do not include the reference then the Dictionary object needs to be declared as an Object type and BinaryCompare set as a constant equal to 0. It can work on data across multiple columns. Here are a couple of examples to validate the UDF’s results. 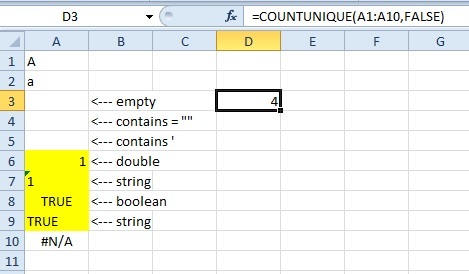 The code to get a unique count is very similar. Using a well-written UDF is a good solution to this problem. The complications apparent in the FREQUENCY() formula are hidden away in the UDF’s code which allows for a simple formula. The calculation performance of the Dictionary UDF is superior to the FREQUENCY() formula, particularly when there are a lot of different values in the precedent range. The flexibility afforded by using code also allows for simple adjustments to enhance the features of the UDF, such as making it case-sensitive. Are there other good ways to get a distinct (or unique) count? Yes, there are. Two good options would be to use the advanced filter or a pivot table to get a distinct list and then use a simple formula to count the items in that list. I’ve got a blog post planned for automating the advanced filter using VBA, so I’ll cover that in more detail then. This entry was posted in Microsoft Excel, Microsoft Office and tagged Array, blank, Charles Williams, Collection, COUNTDISTINCT, COUNTUNIQUE, CreateObject, Dictionary, Distinct Count, empty, Frequency, Microsoft Scripting Runtime, New, scrrun.dll, Static, UDF, Unique Count, UsedRange, User Defined Function, VBA. Bookmark the permalink. Hi Colin. I did a post at http://dailydoseofexcel.com/archives/2013/10/23/dictionaries-can-be-rude/ recently that did some testing of deduping using dictionaries vs other approaches that may be of interest. Among other things, it turns out that if you have lots of unique items, if you sort them first before you add them to the dictionary, things run considerably faster. It works perfectly! It really helped a lot.